A gluten-free Maui vacation can truly be paradise, with a little preparation and research. The lush Hawaiian breeze, sun shining on your face, waves of the Pacific crashing magnificently and not a worry about cross contamination. Hmm. It is paradise, that’s true, but that doesn’t mean that you can avoid fretting about gluten completely. Although I personally think a gluten-free island would be a great concept. We’ve taken five trips to the Hawaiian islands. Each trip has been uniquely amazing. 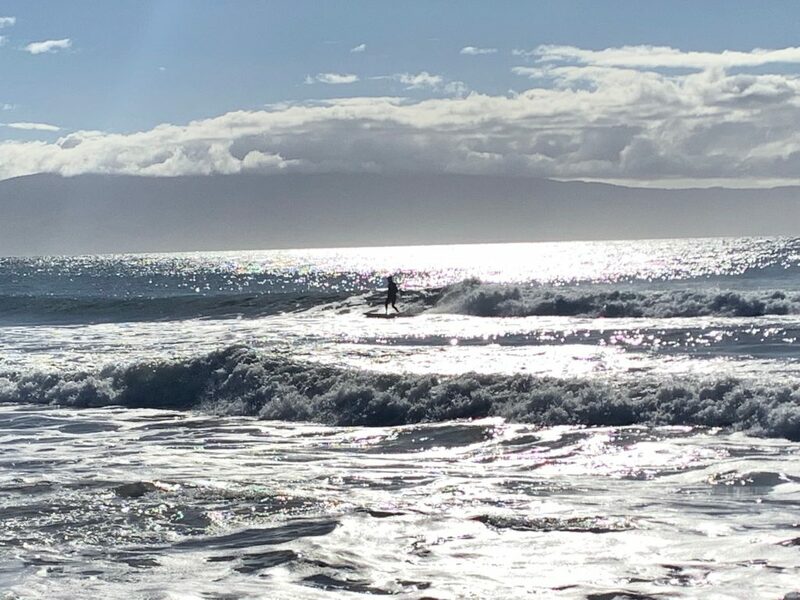 People seem to think flights to Hawaii are too long to be worth it. Our family lives in the Midwest so it’s a minimum of 2 flights and 10-12 hours each way. Folks, it is completely worth the trip, the flights and the penny pinching to get there. The climate and variability of the island weather can be persistently inconsistent but that is what makes Hawaii so uniquely amazing. In one minute you can experience arid 10,000 ft peaks of Haleakala and an asteroid wonderland. The next hour you can be venturing on the road to Hana with rainforests and waterfalls at every turn. Absolute paradise. Unfortunately as with most vacationing, it comes with a warning sign: this may contain gluten! Planning this way also helps save some of the travel budget for dinner. It is difficult to find SAFE, gluten-free food from less expensive restaurants, like food trucks, etc. More expensive restaurants typically pay more attention to cross contamination concerns. So plan for breakfast and lunch meals that will satisfy you to make you happy, and enjoy some nice meals out for dinner. 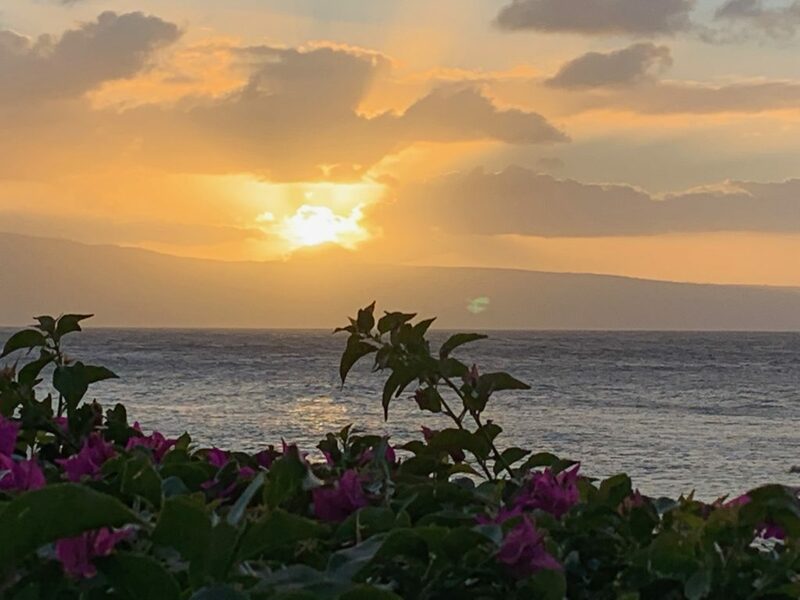 Here’s my guide to keeping your Maui vacation as safe and pleasurable as possible. *Tip – place liquids that weigh more than 4 ounces in your checked luggage. Double Ziploc bag them in case they rupture or break! If a standard hotel room is your destination, plan to request an additional beverage fridge for the room. This allows extra space to store food in the room and still be able to assemble some breakfast and lunch options. Planning for hotel stays, I will usually pack some hard-boiled eggs, canned tuna or chicken for my lunch salads and wraps for easy protein. If I feel like making some gluten-free toast for breakfast I buy an inexpensive toaster for under $10 and bring it along for the hotel room. I have yet to visit a Hawaii without stopping at Costco after landing. A brutal experience after a long flight, but it’s great to get some staples before heading to your destination for some rest. Take the time to look around and find some items that will make your stay easier and more delicious. They have the best pricing on local macadamia nuts and chocolates for souvenirs also. Here’s a sampling of what I usually purchase. Fresh fruit. Local sliced pineapple and apple bananas are my favorite but they were not there this time. We went to Times Market in Kaanapali to find these. There’s plenty of fruit stands also. Fresh veggies. We bought our mainstay Costco baby carrots and hummus as well as some baby spinach and salad mix for my lunch salads. Snacks. Guacamole and chips for our own “aloha hour” where we make the kids some mocktails with the Aloha Hawaiian juices and snacks while we enjoy a beverage! I love the Kohala Coconut Rum, pineapple juice and Lacroix for an aloha hour beverage. Liquor. Costco has best prices on alcohol and wine, hands down. They have a great selection of Malbec, which is my varietal of choice. I tend to react to American grown wine, a whole different issue. Beverages. I was thrilled to find Lacroix at the Maui Costco for the first time ever! It’s pricey, nearly $13 for the Lacroix Curate 24 pack but I had previously paid $1 a can at a natural foods store in Kapalua. Coffee. We always pick up some 100% Kona coffee here. Milk. $5 a gallon, but a steal compared to the supermarket prices. Frozen foods for the kiddos. On this trip we bought some easy lunch and breakfast items for the kids to make the trip a bit easier on prep and cleanup. No judgement! 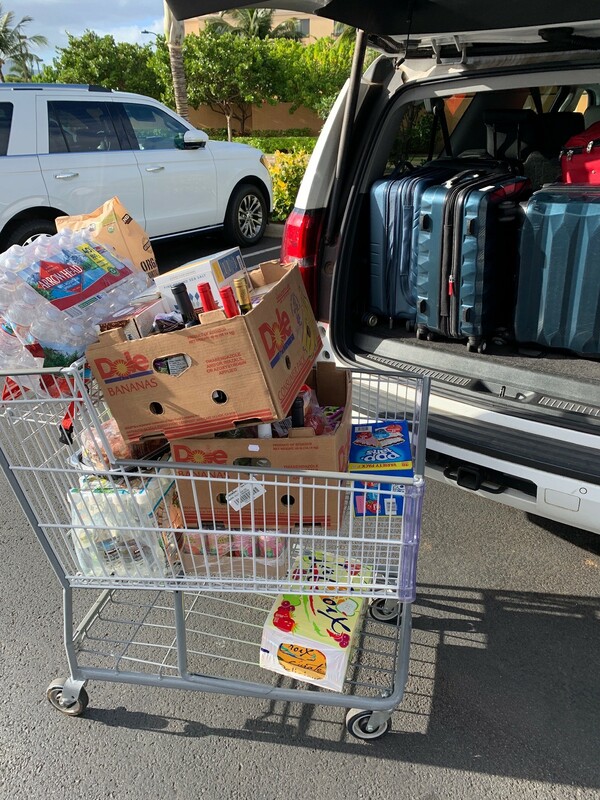 We bought Uncrustables, Pop Tarts, breakfast sandwiches and mini tacos. I’m going to blame the fogginess from the long travel day on my inability to say no to all that junk food. Paleo Crepes with almond butter and bananas. O’Doughs bagel thins with egg/bacon bought at Costco. Grilled chicken (cooked at home, sliced, frozen in a Ziploc bag and packed in a soft sided cooler with a freezer pack) to eat with salad, tomatoes, carrots and preferred salad dressing or sauce that I packed along. I also packed Siete almond flour tortillas for the chicken if I got tired of eating salad. I packed these Paleo Breakfast Muffins for the plane ride for my entire family. This is an excellent spot, with a lovely open-air view of Lanai. Though the menu is pricey (like most hotel restaurants) it offers a great happy hour from 5-6 nightly. The menu doesn’t have GF noted but they are extremely accommodating here and the Hawaiian inspired local cuisine is spot on! 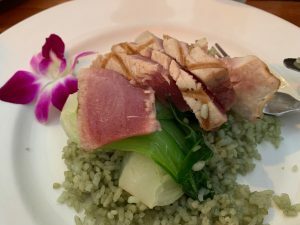 Dining at Leilani’s is a delight in views and all things Maui. They have a more casual grill on the lower level and upstairs is a more ‘formal’ setting, reservations suggested. Their staff is knowledgeable and their menu simple and accommodating to crafting safe gluten-free meals. My personal favorite is the Opakapaka (however they are serving it) and the Maui Fresh salad! Set right on the beach Duke’s sports a romantic tiki torch lit atmosphere. The fish selections also change frequently. We dined there twice, the first time we ordered the Maui Farm Salad and it was on the bland side. My dish was the Furikake Ahi Steak. The manager placed the order and told me the only change would be steamed bok choy instead of the black bean bok choy. 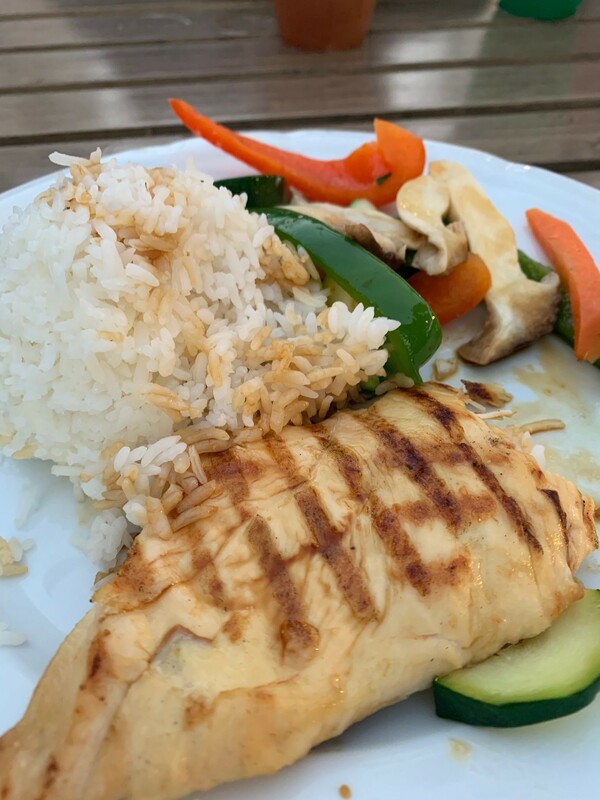 The kitchen did omit all the other accompaniments so the dish was quite plain, which is why I always have a San-J gluten-free soy sauce packets on hand. The manager did unnecessarily comp the dish. A few nights later we enjoyed the Rocket Salad, which was superb, and I ordered the Opah in a coconut thai sauce. Divine. Highly recommend! Dukes and Leilani’s are owned by the TS Restaurant Group, and I do applaud their extra efforts on allergens. Both restaurants also carry a gluten-free, dairy-free dessert called the Lilikoi Pono Pie. Hyatt Hotels has a great corporate culture for gluten-free guests. I have rarely had an issue with a meal at a Hyatt resort. This held true for our stay at the Grand Hyatt Kauai as well as a previous stay at the Hyatt Regency Maui. We wanted our kids to experience a Hawaiian Lu’au and the Hyatt seemed like the perfect fit. I made a note regarding my dietary needs on the ticket site and spoke with the banquet manager, Damian when we checked in. He informed me that the entire buffet was gluten free, each item had a card noting that it was gluten free, vegan or both. Unfortunately the dinner rolls were at the beginning of the buffet line. Not an option in my book— too much risk for cross contamination down the line with the gluten right up front, big bummer. Damian did offer a meal cooked in their kitchen of grilled chicken, rice and vegetables and I took him up on it. It came out super plain with no seasoning at all but at this point of the trip I was OK with plain. Wished I could have tried a few traditional lu’au items though! I asked for some fresh fruit, which they brought out. I had read online that they had gluten-free banana bread but I’m not sure how safe that would have been anyway. It seemed like a pretty high priced ticket for the meal I got but at least my kids were free and my husband hit the buffet several times to make it worth it! Mama’s Fish House website says Open Table has coined them the “Second most popular restaurant in the U.S.” Now that’s an impressive stat. But it is not hard to see why! This is a place that definitely needs a reservation and is one of the priciest restaurants on the island. Many people recommended this spot and it hit our expectations on all levels – food, service and atmosphere. 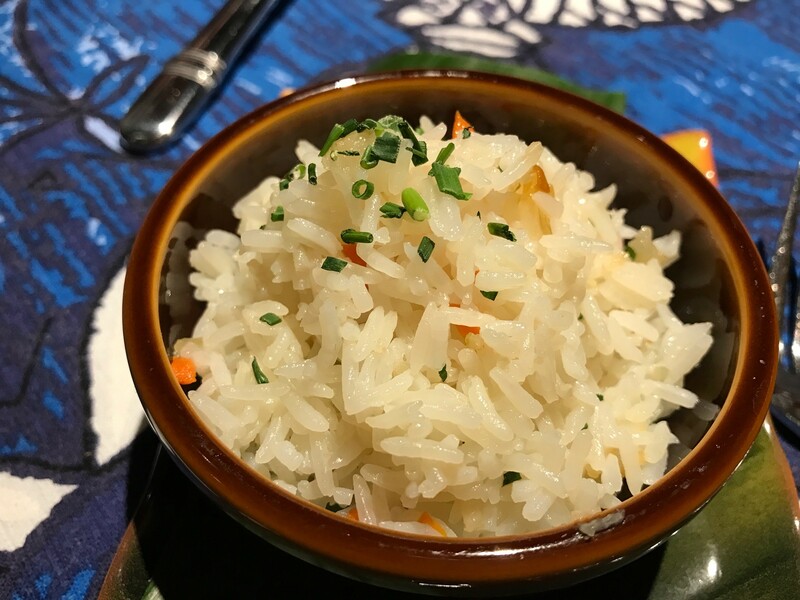 I selected the poached opakapaka with jasmine rice and it was amazing! Mama’s sources all of their fish locally on a daily basis. They even list the name of the fisherman and boat that caught the fish. The meal was amazing. The cocktail of choice was a Strawberry Guava Fizz with gluten-free, Maui-made Ocean Vodka. 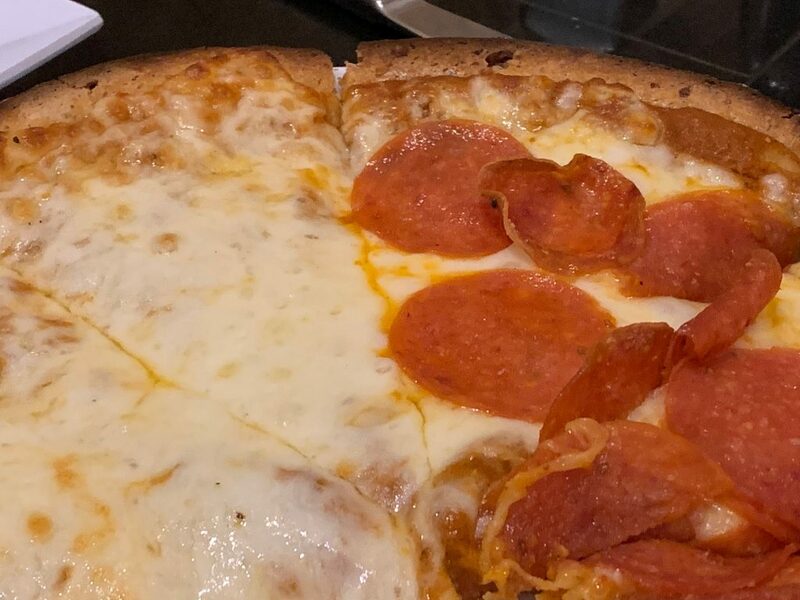 Equally delicious. A full menu with pizza, entrees, appetizers and dessert and I can select whatever I would like? Choosing something I actually feel like eating instead of choosing the “safest” menu item, the most bland menu item? Oh my, I have died and gone to Maui Brick Oven heaven. This place has a little slice of GF paradise in my heart. My family will call this the meal where mom “didn’t share” the dessert and had coconut fried shrimp, sweet potato fries, a delicious mixed greens salad, a slice of pizza and a brownie with ice cream! Wow, I did some serious work here, making up for all the meals where what I am able to safely enjoy is so limited. I do think part of the magic here is the story and owners heart behind this restaurant .We were lucky enough to have the charming owner Leanne be our server while her husband Terry ran the pizza oven on a very busy Saturday night (plain to see why they are looking for space to expand, it was packed). Here’s an article on their family business. 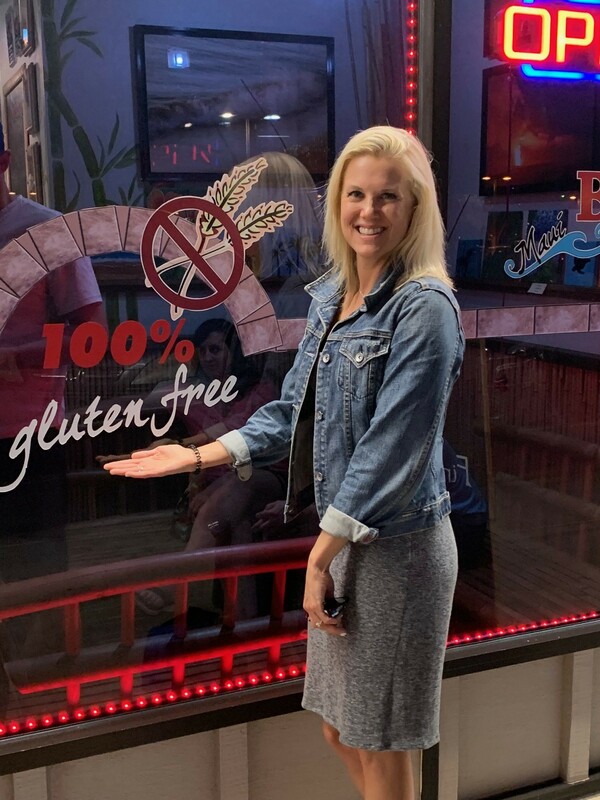 I believe the real key behind a successful gluten-free restaurant is that it is satisfying for those that are NOT required to eat gluten-free. My husband and kids are pretty tough tests and they ate every bit of their pizza that night. It was legit delicious. 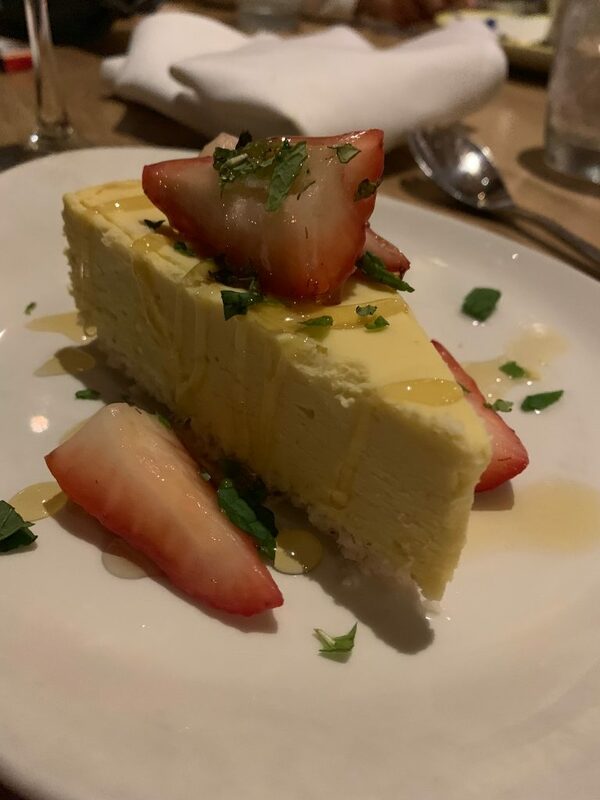 If you land on the island of Maui please, please make your way to this gluten-free gem and eat your heart out – I may have to rename it Maui Brick Heaven. Sushi in Hawaii is something one should always make a priority. The access to fresh fish is so plentiful compared to what we have access to in the Midwest. I chose Sansei in Kapalua due to its favorable reviews on Find Me Gluten Free and its proximity to our resort. In addition they apply a 25% discount to your order prior to 6 p.m. I made reservations for 5:15 and it was a good thing! We arrived right at 5:10 to two significant lines outside. One line was for reservations and one was for parties without reservations. We were seated and the gluten-free menu was presented to me. It’s extensive. 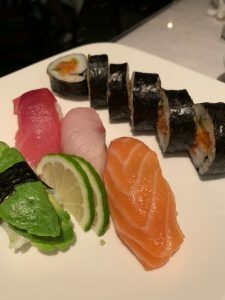 I was so excited to try a new variety of sushi. Our children chose to order chicken fingers and macaroni and cheese but the girls did try some California rolls. We started our night with the Sansei Style Ahi Poke. A wonderfully flavorful dish with Maui onions, wakame and kaiware sprouts in a gluten-free poke sauce. Our roll selection included the Issei Sushi Combo, Spicy Tuna, Hawaiian Roll, Scallop and Cucumber Roll and the Spicy Japanese BLT Roll. 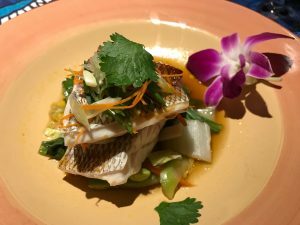 This was a great dining experience for all of us and we will definitely return the next time we visit Maui. Megan Ringenberg is a Nebraska native with a BA in Journalism and Public Relations. She is the voice behind www.glutenfreesogood.com, enjoys gluten-free travel, restaurant research and recipe development. 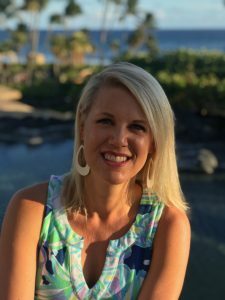 She is an advocate for individuals with celiac disease and gluten-related disorders and supports all things gluten-free. 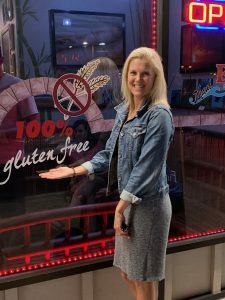 Megan previously worked as communications coordinator for the Celiac Support Association and currently runs the gluten-free support group in Omaha, NE. Megan loves to travel and explore with her husband Kyle and three children; Julia, Jade and Grant. Connect with Megan on Facebook, Instagram or Twitter.